Let Japan Centre introduce you to the wonderful world of nabe! Nabe (pronounced nar-bey) refers to a dish that is cooked with one pot, and usually contains an abundance of veg, some kind of protein and a ruddy delicious stock. The varieties are almost endless however, as folk tend to throw in whatever ingredients they have lying around, which changes with the seasons. The process of making nabe is always a sociable one, and the image of the family huddled around, chewing the fat whilst digging into nabe is an evocative one for Japanese, rather akin to a British family enjoying a hearty Sunday roast. What kind of nabe is out there? Are you looking to gain a vast amount of weight? Chankonabe could be the key, for it is the dish responsible for keeping sumo wrestlers rotund, round and robust for many many centuries. The soup is usually dashi or chicken stock based, brimming with powerful protein in the form of chicken, tofu, fish balls and beef. Whilst this alone does not a heffalump make, it is the sheer portions consumed by these big boys that result in their Goliath like figures. They’ve also got some tricks up their chubby sleeves- sumo lads always take a nap after gorging on chankonabe, which means all that energy has nowhere to go and thus becomes fat. That’s science that is. Simple, clean and elegant, yudofu is a Kyoto classic that elevates tofu to an art form. 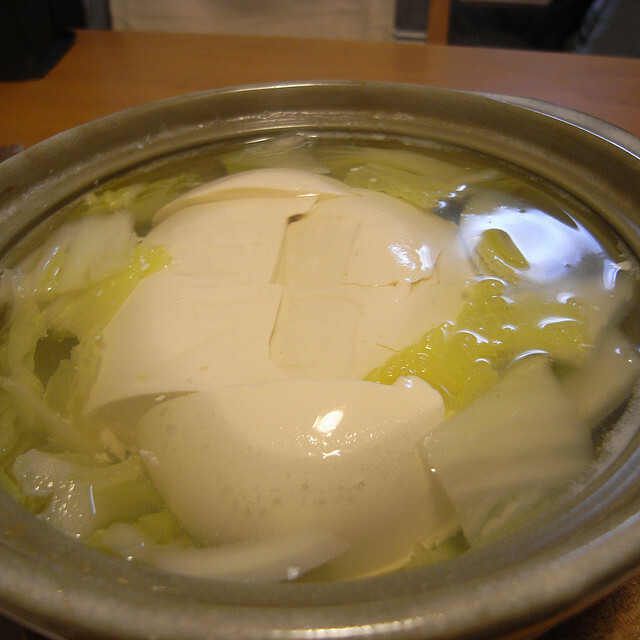 Favoured by Buddhist monks, yudofu is a nabe dish that combines delicately flavoured broth with cotton tofu. Very zen. This lovely sounding variety is one of the most fun and interactive nabe experiences. Diners sit around a pot of boiling broth flavoured with dashi and konbu and stuffed full of vegetables, then use their chopsticks to swish thin slices of beef to and fro until cooked through. The term ‘shabu shabu’ actually refers to the noise of said morsels swishing through the broth. As with other nabe varieties there is a slight drawback- excavating the ‘scum’ that arises from the fat in the meat and sits on top of the broth. Laaaaverly. One of the wonderful things about nabe is the variety, and ingredients that can make up a smashing nabe include: miso, kimchi, curry, soy, mirin, dashi, tofu and more. 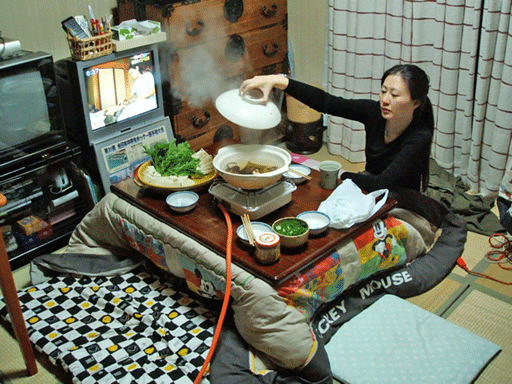 For many, the kotatsu table is an essential part of the nabe experience. Ingenious contraptions that feature a heating element craftily located under the tables base and then covered with a blanket to trap the heat, Japanese families beat the winter blues by getting toasty under the kotatsu and noshing on nabe. The heated kotatsu table keeps your trotters toasty whilst you dine. As we all know, too many cooks spoil the broth. Ever eager to keep their precious broth entirely unspoiled, Japanese families often elect one nabe leader to take charge, christened ‘nabe bugyo,’ who carefully tends to the introduction of new ingredients to the dish. Why have one stew when you can have two? 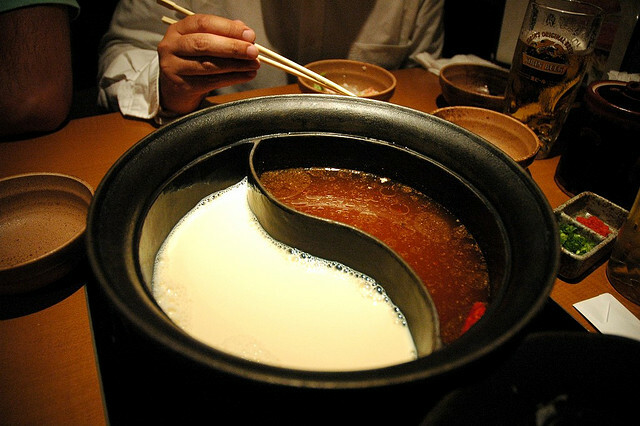 This nabe pot is ingeniously separated to allow for double nabe delight. If all this nabe natter has got you needing nourishment, we’ve got our own selection of nabe recipes just waiting to be tried. Do you have what it takes to be the nabe bugyo? There’s only one way to find out. Try our gyoza nabe hot pot, Korean style kimuchi nabe hot pot or the sumo sensation that is chankonabe recipes. We’ve got a ton of ingredients for nabe at Japan Centre. Come and have a cheeky browse. 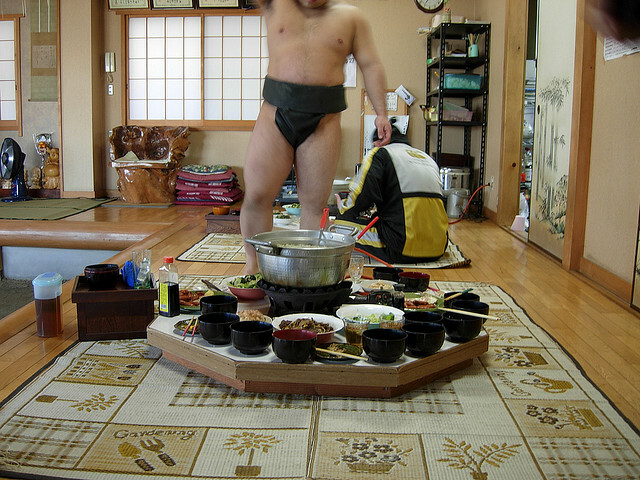 Thanks to pyramis at flickr for the chankonabe image. Thanks to hightown99 at flickr for the yudofu image. Thanks to wendywong:p at flickr for the shabu shabu image. Thanks to Gustavo Verissimo at flickr for the split nabe pot image. Thanks to bimboAuJapon at flickr for the kotatsu image. Thanks to MKcompany(heromania) at Vine for the shabu shabu clip. Posted in Food and tagged Healthy, hot-pot, japan, japanese hot pot, japanese stew, nabe, shabu-shabu, winter food, yudofu. Bookmark the permalink.